I was wondering how to go about setting up a pool I disassembled. It's frame work is made up of eight pieces of U channel steel. They bolt together to form a rectangle, then the inner walls (plywood)are nailed to the support beams(2x4s). Hi Ed. I don't have any experience with this kind of pool so I am probably not going to be much help. Maybe another person reading this might have some ideas to share. As with all pools, leveling is critical. Check it and recheck it many times and get it perfect. Another consideration is to keep the rectangle a true rectangle. Use your tape measure from one corner to the opposite corner and then the other set of corners. These readings need to be the same, otherwise the structure is not square. Other than that it sounds like you have your hands full, best of luck with it. I am looking to purchase a replacement liner for my 16' x 32' rectangular pool. I am having a problem finding rectangular liners. I noticed that on a few web sites including the wilkes site that an oval liner the same size should fit the rectangular pool. I was just wondering if there was any truth to this? Hi Crystal. Not in my mind, anyway. There is no way I can see a 16' x 32' oval pool liner fitting a 16' x 32' rectangular pool. 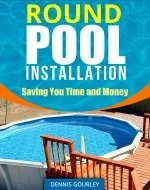 A rectangular pool would require a beaded liner, and beaded liners need to be exactly the same size as the pool, no exceptions. If you were talking about overlap liners, possibly, but that is still a lot of stretching for the oval liner to reach the corners of a rectangular pool. I would go to InTheSwim and see if they have the right size liner, with a bead style that would fit you make of pool. If they don't have it they can make one. Trust me, it's worth the extra money to get a liner that fits your pool. I disassembled this pool for an older gentleman who could no longer care for it. I in turn would like to install this beauty in my back yard. It was fairly easy to take down but I am certain it will take some key steps done properly during the set up to ensure years of fun. Can you help with a simple flow chart. maybe a 4 5 or 6 step process? My biggest question is how to assemble the bottom and top frame work. its so heavy. What's the secret? 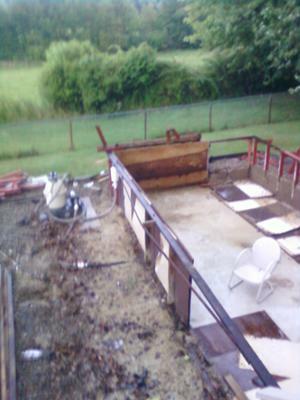 I will attach a picture of the deconstruction process so you can see the type of pool it is. Hi Ed. I would have no idea how to advise you with step by step instructions. This is not a pool I am familiar with. I will post this in case someone else recognizes the pool and has had some experience with it. I hope the take down, move and reinstall go well for you and would love to see the final result.